A residential treatment program for girls with emotional and behavioral problems in Arlington, Massachusetts, shut down in September after a decision by its parent organization to shift focus to community-based services. That decision impacted 150 staff members at the Germaine Lawrence campus on Claremont Avenue operated by the national private non-profit Youth Villages. The vast majority of positions are direct care staff, including several master’s level and licensed positions, nursing and maintenance staff. The program is licensed to serve a maximum of 72 girls between the ages of 12 and 22. 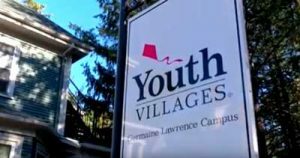 But there were only 48 girls on site when Youth Villages announced the pending closure on July 25, down from a high of about 67 last spring, said Matt Stone MSW, executive director of Youth Villages Massachusetts-New Hampshire. The number decreased to 32 as of mid-August and the last of the girls were scheduled to be placed by mid-September. Stone said the organization was “working very closely and collaboratively” with the state Department of Children & Families (DCF) to place the remaining girls in suitable settings for their needs. Youth Villages/Germaine Lawrence entered a three-year contract with DCF beginning July 1, 2017, to provide residential education and group home services for youth in state custody. But it had the ability to terminate its contract with the state at any time, according to DCF staff. The state agency said its social workers were supporting the youth residing at the program during the transition to ensure their safety and well-being. Germaine Lawrence served girls mostly from Massachusetts, although some have come from Rhode Island and New Hampshire in recent years. Presenting issues have typically ranged from behavioral problems like physical and verbal aggression and truancy to depression, self-harm and suicidal ideation. Stone said Youth Villages will have some opportunities for staff in community-based programs but that many will face layoffs. Two job fairs were held in the gym on the campus in August. The Germaine Lawrence campus is located on three acres with seven buildings, five of them are two-story dormitories. Stone said Youth Villages will continue to operate community-based programs. He noted that the next six months will be spent evaluating what to do with the campus. Youth Villages owns six buildings and leases its administration building. Youth Villages is a national non-profit operating in 12 states with headquarters in Memphis, Tennessee. The organizations started as a merging of two residential treatment facilities but evolved in focus in the late 1980s and 1990s to add community-based and in-home services.